Power will be supplied by the all-new 6.2L LT1 V8 engine coupled with a 7-speed manual transmission with active rev matching. The engine provides 460 hp (343 kW) at 6,000 rpm and 630 NM (465 lb-ft) of torque at 4,600 rpm with the performance exhaust system*. The Stingray has achieved the highest standard power ratings ever for the Corvette. It is expected to hit 60 mph in less than four seconds and deliver improved fuel economy. Additionally, the Corvette Stingray features the new tablet-inspired state-of-the-art Chevrolet MyLink connected radio with two 8-inch display screens (with a screen personalisation option), USB port, SD card and auxiliary input jacks, as well a centre screen that lowers for device storage. There are also several options available including; Metallic paint (£600), Tintcoat Paint (£1,000), Navigation System (£1,450) and Black Aluminium Wheels (£550). 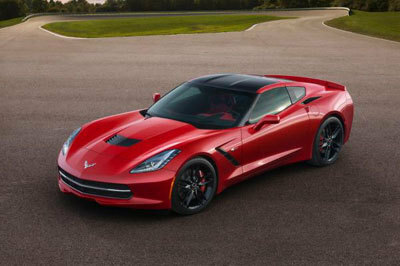 For more information on the Corvette Stringray coupe and prices, visit chevrolet.co.uk.